This article is the result of an interview with Jennifer Odom, one of the 2018 Hearing Aid Scholarship recipients. This scholarship program assists those who have Turner syndrome. Jennifer was so thankful when she heard the news about receiving the hearing aids scholarship from Leaping Butterfly Ministry (LBM). She was able to work with her local audiologist, Dr. Andrea Gray. Hearing Instrument Specialist Cassie Clark, who also chairs the Hearing Aid Committee for LBM, worked with Dr. Gray to select the best aids for Jennifer. Before she received the new pair of hearing aids from LBM, Jennifer could not hear at all without the aids and the hearing in her right ear was far worse than the left ear. Although she is still adjusting to hearing background noise, Jennifer considers LBM’s generous donation a gift and a blessing from God. She says her life has changed for the better with her new hearing aids. Jennifer can’t pinpoint the exact time that she lost her hearing; but, she does remember using a tape recorder while in college. 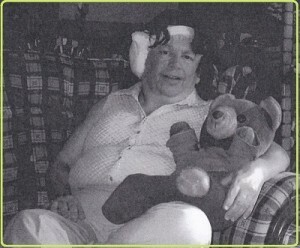 She got her first hearing aid when she was working at her first job in Cambridge, Maryland, when Miracle Ear supplied the aids to her at cost. When she later moved back to Indiana, she had ear surgery with Dr. McKinney and then she had follow-up ear surgery in 2014 to reconstruct her hearing. Jennifer recovered from surgery with her friend Good Neigh Bear. She needed new hearing aids since her last surgery. Jennifer graduated from Ball State University with a degree in education in 1974. After graduation, she knew she did not want to teach in a public school; instead, she wanted to teach at a Christian school. After seeing an ad in a local Indiana church publication, Restoration Herald, she interviewed at a school in Cambridge, Maryland to be a first-grade teacher. She started teaching at Countryside Christian School in 1975. During the summer of 1978, her brother-in-law and nephew went on a mission trip to Haiti to build a church. Missionaries in Africa were sponsoring the trip to Haiti and their nephew, David, was meeting Jennifer’s relatives at the Indianapolis airport. Jennifer’s mom had gone to the airport for the send-off and had met David. Her mom came home and told Jennifer that she really needed to meet David. After the mission trip was over, Jennifer rode with her sister to the Indianapolis airport to pick up her relatives when they returned home and hoped to meet David. But, David wasn’t on the flight. Instead, he was on a direct flight to Chicago. Jennifer never got to meet him. During Thanksgiving, her sister had a friend say that she had someone that lived in Chicago that Jennifer needed to meet. After everyone visited about this man in Chicago, they all realized that they were all talking about the same David … the same person that everyone had wanted to her to meet. God was clearly pointing out her destined partner over and over again! After a couple of more attempts to meet, Jennifer sent David an introduction letter and he sent her a letter and picture back. They finally met on Spring Break in 1979. David met with her sisters and her parents later that summer. Mom’s comment about David was “he doesn’t talk.” Jennifer laughs about how quiet David was with her family. Jennifer had decided to come back to Indiana in 1979 to be with her family and God blessed her with a teaching job at a new school in Harlan (Harlan Christian School). Christmas 1979, Jennifer visited David in Chicago and he proposed to her. 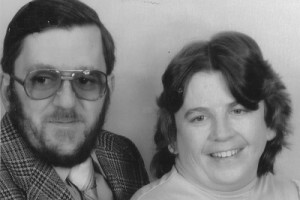 They waited until school was out to get married and were wed on August 9, 1980. Jennifer on her wedding day, August 9, 1980. It was a record hot day with no air conditioning. Jennifer’s matron of honor is helping her. 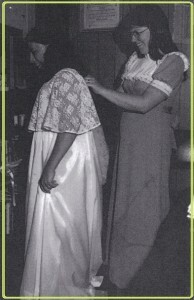 Her sister Julie made the dress. One of 10 children, Jennifer was #6. She was born at home in Mooreland, Indiana, because they didn’t make it to the hospital in time. The family chuckles that Jennifer just couldn’t wait to get here. She says that she’s hurried all her life since. 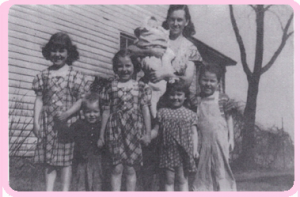 Spring 1950: Jennifer is from a family of 10. Here she is with her sisters Julie, Sara and Sue. Her brothers are Alfred and Mark. Mom is holding Jennifer. Jennifer’s dad passed in 1993, her mom passed in 2001 and one of her brothers passed in June last year. She enjoys spending time with her other brothers and sisters and just met all of them at a family reunion a week ago. Her family always commented that she was going to be small; however, no one realized that she had Turner syndrome. When she was working in Lincoln at a Christian nursing home when she was 33 years old (in 1973), they required her to take a physical. The nurse took her vitals and asked if she was being treated for high blood pressure. The doctor then came in with a tape recorder and asked if he could record a call between a cardiologist and a geneticist. Later, the Cardiologist in Springfield, Illinois, confirmed that Jennifer needed her aorta repaired and the Geneticist confirmed that she had Turner syndrome. She also learned that she couldn’t have children at that time. The cardiologist had recommended a heart catherization; but, she had to wait for surgery due to financial hardship. Jennifer, her husband and her family started praying for a miracle. Then, on June 30, 1983 (her mother’s birthday), a local rehabilitation counselor called and said, “Get yourself to the hospital for surgery. The insurance at the Christian nursing home was going to cover the cost of the surgery.” Jennifer was shocked. She went to the hospital and had her aorta repaired with no out of pocket costs. Jennifer retired from teaching in 1980 and moved to Lincoln, Illinois to be close to David’s parents. David attended Lincoln Bible College and together they worked in a Christian’s Children’s home from 1982 to 1985. Unfortunately, one of the troubled boys at the home pulled a knife on David. Soon after that, an elder serving on the school board at Countryside Christian School called, said a teacher was leaving and that they wanted Jennifer back as a teacher. Plus, the elder said that they had a job for David. They both returned to Cambridge, Maryland, and worked at the school from 1985 to 2007. Jennifer and David now live in Lafayette, Indiana, in adult senior housing where they have great friendships. They are both hoping their health remains stable and plan to return to Maryland on their 38-year anniversary, August 9, to see friends that they haven’t seen since they last visited 5 years ago. Thank you to those who donated funds to LBM’s hearing aid scholarship program. What a difference you have made! Leaping Butterfly Ministry relies on donations to change lives, to create awareness of Turner syndrome, contribute funds for research, and support for those touched by TS. Click here to see how you can help.